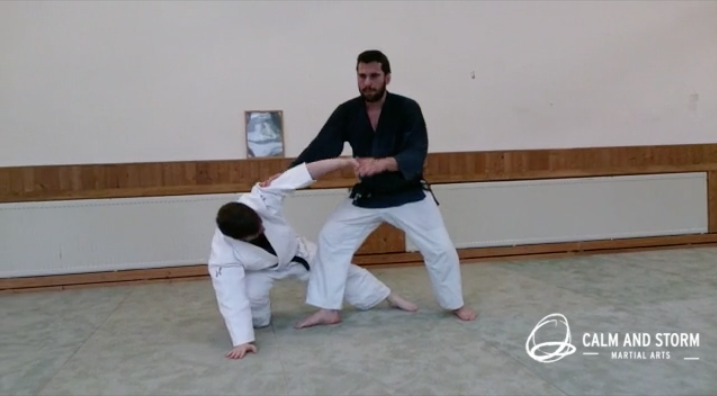 Firstly, a variation of Ikkyo omote in which the first third is used for a basic flinch response closing of the body, followed by an opening of the body into the technique. The second part of the moment done this way emphasises the stretch on one side of the body, which is meant to help feel a sense of elastic connection and then use it as a means to propel the next step/kick. This was also the topic at another seminar in Frankfurt/Germany, earlier this year, of which you can find a video here: vimeo.com/169174654, and a related blogpost here: calmandstorm.net/2016/07/01/aunkai-bujutsu-interim-report-part-3-connection/. Finally, the third part of the movement done this way emphasises another opening/closing type movement in/on rotation (not unlike a Taiji Lu). Second, we used a variation of Soto kaiten nage as one of many possibility to practice or apply Sage te (the lowering of hands). The emphasis here was to explore such possibilities outside of the standard exercise(s) in and through which we practice Sage te in Aunkai, but also in keeping with some of the initially exaggerated movement that is intended to help explore some of the spinal movement that is reduced in amplitude later on (in application). Given the specific focus in which we used the mid-section of this form, we didn’t pay all too much attention to the entry and the throw from any particularly martial perspective. The exercises in the two excerpts, both filmed at random, are used in the way in which I suggest that forms/techniques are best used, that is, as exercises that are particularly amenable to practicing and exploring certain bodily skills, sensations and qualities, rather than as techniques to be applied in exactly that way in any or a given situation. Many thanks to Norbert Sutor (3rd Dan Aikido), Anke Dzewas (1st Dan Aikido), and Kathrin Hysky (1st Dan Aikido) from Aikido Dojo Giessen (aikido-dojo-giessen.de) for inviting me for the second time and hosting the seminar. Looking forward to seeing everyone again in the hopefully not so distant future!